"ALMIGHTY God, our heavenly Father, in whose hands are the living and the dead; We give thee thanks for all those thy servants who have laid down their lives in the service of our country. Grant to them thy mercy and the light of thy presence, that the good work which thou hast begun in them may be perfected; through Jesus Christ thy Son our Lord. Amen." This beautiful prayer, found in the 1928 edition of the Protestant Episcopal Church of the United States, was excised from their 1979 prayerbook, along with other prayers for members of our Armed Forces. Perhaps, this was fed by the Liberal animus towards all things military which was so prevalent in those post-Vietnam days of the late 1970's. Perhaps it was a result of that unpopular war that the crafters of the new prayerbook intentionally left it out. The morality/immorality of war is a discussion for another day, yet, we have an obligation to remember those who answered the Republic's call in the time of struggle. So today, we pause to remember the Blacksmith who fell at the Battle of the Brandywine. We recall the carpenter who fell in Maryland in the Battle of Bladensburg, the clerk who fell at Marye's Heights, and the iron worker who fell on a beach in Normandy. From Camden to Kandahar, have given their last breath, answering the call. 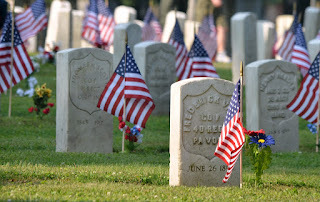 This is why we stop on the last Monday in May to remember them.